With more than 2,200 units from coast to coast, the NAACP is proud to be one of the largest grassroots organizations in the United States. The men, women and young people who comprise our volunteer field membership form the backbone of the Association and the civil rights movement itself. Founded in 1910, The CRISIS is the official publication of the NAACP. It is a quarterly journal of civil rights, history, politics, and culture and seeks to educate and challenge its readers about issues that continue to plague African Americans and other communities of color. For over 100 years, The CRISIS has been the magazine of opinion and thought leaders, decision makers, peacemakers and justice seekers. It has chronicled, informed, educated, entertained and, in many instances, set the economic, political and social agenda for our nation and its multi-ethnic citizens. 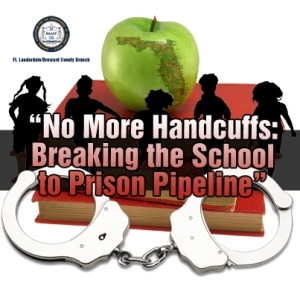 The NAACP has brokered a groundbreaking collaborative agreement on school discipline with Broward County Public Schools, law enforcement and its community partners. The agreement will serve as a model for school districts nationwide that aim to end the school to prison pipeline wreaking havoc in communities of color.